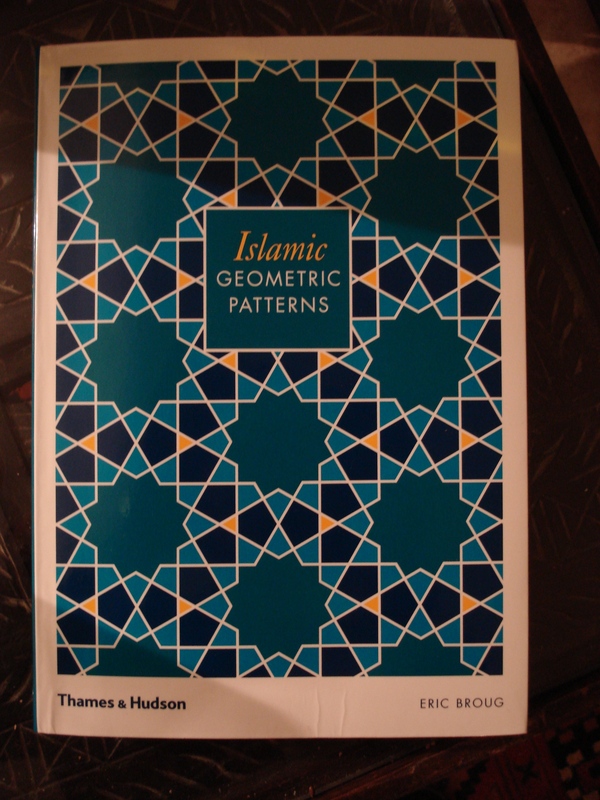 The English translation of Eric Broug’s nice booklet on Islamic geometric patterns has just been published by Thames and Hudson. 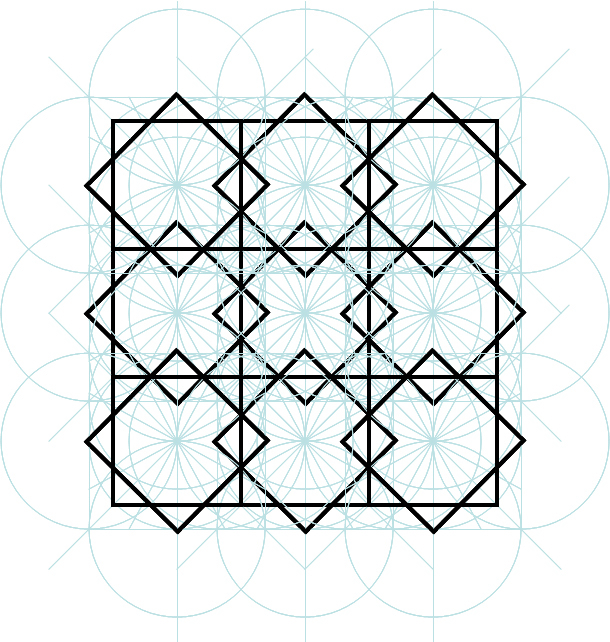 Islamic geometric patterns may contribute to the impression of a haven of tranquility and relaxation in paradise gardens or may invite for meditation, contemplation and prayer, for example in a mosque. Complexity may create a level of amazing and magnificent beauty. I have long been fascinated of the dazzling tessellations as one main artistic characteristic in Islamic Art. But how did they create them? It is clear that medieval artisans used a compass and a straightedge. According to modern theories the production of a rather limited set of girih tiles is considered, too. Broug makes it easy on one hand to comprehend the construction step by step. But he also gives an immediate impression of the incredible skills necessary to really create a piece of art. The CD provides further examples and also shows the real buildings in the Islamic world where these marvels can be found. Lacking compass and straightedge nowadays, I immediately tried to use Powerpoint for the first few squared patterns; and succeeded within minutes. This entry was posted in Book Review and tagged compass, Eric Broug, islamic geometric patterns, straightedge. Bookmark the permalink. Oh yes, I have referred to the work of Peter Lu other postings on my blog. See, for example https://aliqapoo.wordpress.com/2008/09/07/dazzling-tessellations/. Hi,Fahad: It might be interesting to get into contact with you and talk about Maragha etc. Have you noticed that I ‘reinvented’ the two girih tiles in the first publication on Maragha in a search for simplification of the Maragha pattern and Lu-Steinhard’s ‘girih’ picture of Maragha is essentially a copy of my picture?The Topkapi manuscript came into prominence only some years after my publication. What is and what is not a quasiperiodic tiling is a question a bit more complicated than you mention. As for Darb-e-Imam, have you seen my response to L-S in Science (electronic)/ Find it! Thanks for your kind comment. It has actually attracted my interest for some time now. See, e.g., here and here. I have actually read the article and your response briefly before I had the opportunity to visit Esfahan (again) and tried to find the small Shrine in Esfahan’s old city in 2007. I returned to Esfahan in the end of 2008 with more knowledge and a better idea of what I had to search for, in particular in the western iwan of the Great Mosque. It had puzzled me for some time. I suppose the respective patterns on the Darb-i Imam on the spandrel and the arch and that very similar in the Great Mosque are not as old as originally thought. The Timurid patterns on the southern iwan and also those on the Darb-i Imam are 15th century by Sayyid Mahmud-e Naqash, but the decagonal patterns probably Safavid, maybe even as late as 18th century. There are constantly restorations being done, so I wondered whether they actually used girih, or proto-tiles, to maintain the dazzling pattern. Anyway, both have similarities with that on the Maragha tower. In the Esfahani patterns, inflation is not present. On the large scale, they are composed of decagons and bowties. The elongated hexagon, which can be seen in the small pattern, is missing. In the Great Mosque, it would have been possible to create the five-pointed stars from two bowties and an elongated hexagon. In that case, well, it would have been a true Penrose tiling, I suppose. Similar re-arrangements would have been possible on the Darb-I Imam spandrel, too. The pattern on the Maragha tower does contain a decagon, bowties and hexagons, but I do not think it’s aperiodic. What do you think? Most designs can actually be constructed by using this set (although there is no prove that artisans had actually used it or are still using it when repairing the decoration).